On December 2, 1942, Enrico Fermi and his team of scientists harnessed the atom and opened the door to new scientific and technological realms. His achievement allowed the U.S. to produce the atomic bomb that helped end World War II. Now, more than fifty years later, nuclear energy provides a significant part of the world's electrical power, and radioactive materials are used for hundreds of industrial, agricultural, and medical applications-from food preservation to cancer therapy, checking the integrity of welds in pipelines and bridge supports, and gauges that measure the thickness of coatings applied to paper. Fermi was born in Rome in 1901 and received his doctorate from the University of Pisa in 1922. During 1923 to 1924, he studied in Gottingen, Germany, with Max Born, and in Leiden, The Netherlands, with Paul Ehrenfest. From 1924 to 1926, Fermi lectured in mathematical physics and mechanics at the University of Florence. He became the first professor of theoretical physics at the University of Rome, where he taught for 12 years. By 1938, Fascist Italy had become intolerable to Fermi. He used his trip to Stockholm as an opportunity to flee. He and his family sailed directly to the United States, where he had visited many times before. In the months before his Stockholm trip, he had sought teaching positions in America and had received offers from five universities. He chose a professorship in Physics at Columbia University. There, in 1939, he confirmed the discovery of the fission process and began striving to attain a nuclear chain reaction. 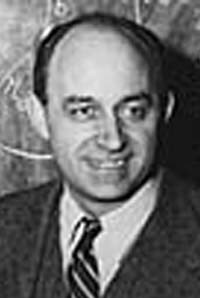 From 1942 to 1944, Fermi worked at the Metallurgical Laboratory of the University of Chicago. In a makeshift laboratory under Stagg Field Stadium, he designed and built the first nuclear reactor and led the epochal experiment that demonstrated the first self-sustained chain reaction. More than any individual, he was responsible for developing a means for the controlled release of nuclear energy. 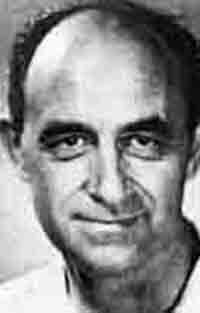 Fermi became a U.S. citizen in 1944. From 1944 to 1945, he became Associate Director of the Los Alamos National Laboratory in New Mexico. In 1946, he returned to the University of Chicago as a professor at the Institute of Nuclear Studies, which now bears his name--Fermi Institute. He resumed his fundamental research interests in nuclear and elementary particle physics and also, beginning in 1950, served as one of the first members of the General Advisory Committee of the Atomic Energy Commission. On November 16, 1954, President Eisenhower and the Atomic Energy Commission gave Fermi a special award for his lifetime of accomplishments in physics and, in particular, for the development of atomic energy. Fermi's other research resulted in the Fermi-Dirac particle statistics, the theory of beta-decay, the Thomas-Fermi model of the atom, and a theory of the origin of cosmic rays. 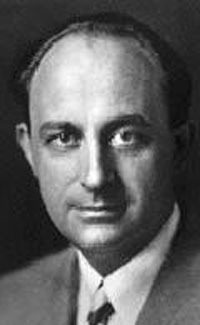 Enrico Fermi was born in Rome on 29th September, 1901, the son of Alberto Fermi, a Chief Inspector of the Ministry of Communications, and Ida de Gattis. He attended a local grammar school, and his early aptitude for mathematics and physics was recognized and encouraged by his father's colleagues, among them A. Amidei. In 1918, he won a fellowship of the Scuola Normale Superiore of Pisa. He spent four years at the University of Pisa, gaining his doctor's degree in physics in 1922, with Professor Puccianti. Soon afterwards, in 1923, he was awarded a scholarship from the Italian Government and spent some months with Professor Max Born in Göttingen. With a Rockefeller Fellowship, in 1924, he moved to Leyden to work with P. Ehrenfest, and later that same year he returned to Italy to occupy for two years (1924-1926) the post of Lecturer in Mathematical Physics and Mechanics at the University of Florence. In 1926, Fermi discovered the statistical laws, nowadays known as the «Fermi statistics», governing the particles subject to Pauli's exclusion principle (now referred to as «fermions», in contrast with «bosons» which obey the Bose-Einstein statistics). In 1927, Fermi was elected Professor of Theoretical Physics at the University of Rome (a post which he retained until 1938, when he - immediately after the receipt of the Nobel Prize - emigrated to America, primarily to escape Mussolini's fascist dictatorship). 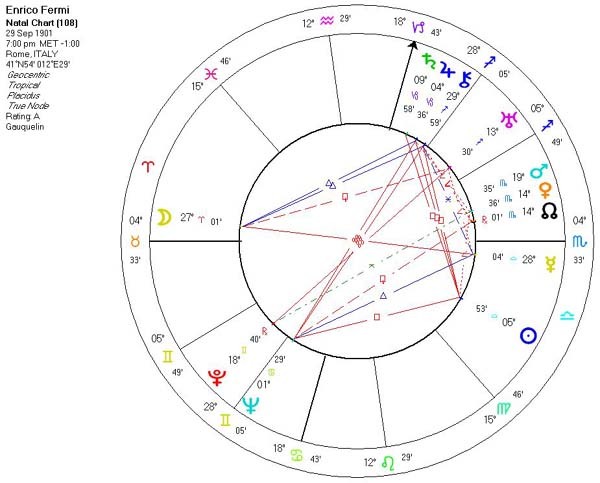 During the early years of his career in Rome he occupied himself with electrodynamic problems and with theoretical investigations on various spectroscopic phenomena. But a capital turning-point came when he directed his attention from the outer electrons towards the atomic nucleus itself. In 1934, he evolved the ß-decay theory, coalescing previous work on radiation theory with Pauli's idea of the neutrino. Following the discovery by Curie and Joliot of artificial radioactivity (1934), he demonstrated that nuclear transformation occurs in almost every element subjected to neutron bombardment. This work resulted in the discovery of slow neutrons that same year, leading to the discovery of nuclear fission and the production of elements lying beyond what was until then the Periodic Table. 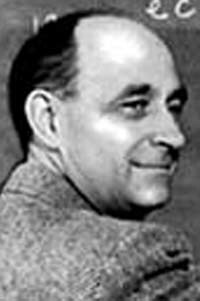 In 1938, Fermi was without doubt the greatest expert on neutrons, and he continued his work on this topic on his arrival in the United States, where he was soon appointed Professor of Physics at Columbia University, N.Y. (1939-I942). 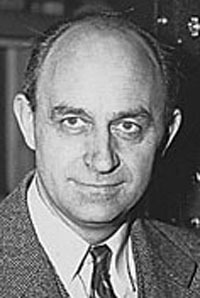 In 1944, Fermi became American citizen, and at the end of the war (1946) he accepted a professorship at the Institute for Nuclear Studies of the University of Chicago, a position which he held until his untimely death in 1954. There he turned his attention to high-energy physics, and led investigations into the pion-nucleon interaction. 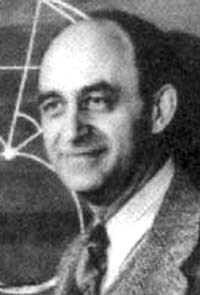 During the last years of his life Fermi occupied himself with the problem of the mysterious origin of cosmic rays, thereby developing a theory, according to which a universal magnetic field - acting as a giant accelerator - would account for the fantastic energies present in the cosmic ray particles. The Nobel Prize for Physics was awarded to Fermi for his work on the artificial radioactivity produced by neutrons, and for nuclear reactions brought about by slow neutrons. The first paper on this subject "Radioattività indotta dal bombardamento di neutroni" was published by him in Ricerca Scientifica, 1934. All the work is collected in the following papers by himself and various collaborators: "Artificial radioactivity produced by neutron bombardment", Proc. Roy. Soc., 1934 and 1935; "On the absorption and diffusion of slow neutrons", Phys. Rev., 1936. The theoretical problems connected with the neutron are discussed by Fermi in the paper "Sul moto dei neutroni lenti", Ricerca Scientfica, 1936. His Collected Papers are being published by a Committee under the Chairmanship of his friend and former pupil, Professor E. Segrè (Nobel Prize winner 1959, with O. Chamberlain, for the discovery of the antiproton). Fermi was member of several academies and learned societies in Italy and abroad (he was early in his career, in 1929, chosen among the first 30 members of the Royal Academy of Italy). As lecturer he was always in great demand (he has also given several courses at the University of Michigan, Ann Arbor; and Stanford University, Calif.). He was the first recipient of a special award of $50,000 - which now bears his name - for work on the atom. 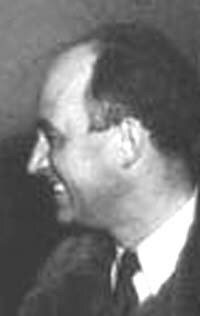 Professor Fermi married Laura Capon in 1928. They had one son Giulio and one daughter Nella. His favourite pastimes were walking, mountaineering, and winter sports. He died in Chicago on 28th November, 1954.